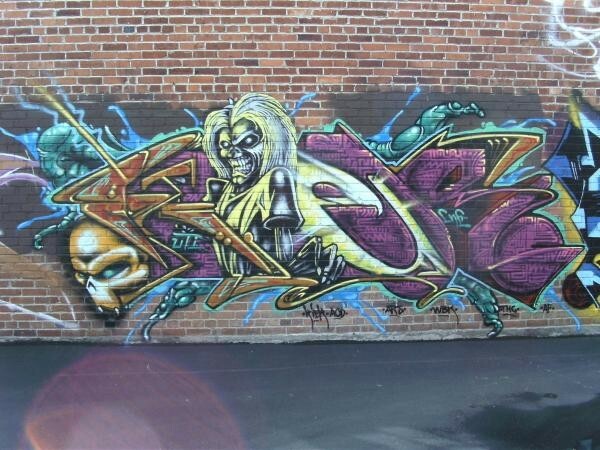 While Graffiti art has been a part of our culture for decades and recognized as an artform in the pop-culture era, only recently has it truly been exploding here in Utah. Moving from being an underground expression that city officials and police view as some kind of destructive force, to being praised, defended and revered for the labored love it actually is. The simple fact that just ten years ago you could only find it in hidden allies and along the walls of the Trax line, to today where respected local galleries have brought in those same painters for complete exhibitions... that's one hell of a turnaround for us. --- One of the big local names to thank for that shift is Kier Defstar. 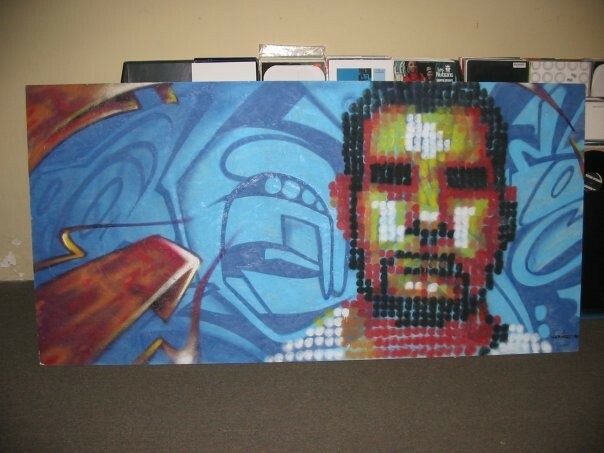 A West Valley City native who learned form some of our city's best and brightest graff artists, has been honing his skills and techniques for over fifteen years. His work near iconic throughout the city as you can find many of his pieces in downtown and the valley, not to mention being a part of the 337 Project, and on occasion taking his work beyond our state to the coasts and meeting different crews, even hitting up Mexico and Costa Rica when visiting. His work receiving such local acclaim, that when City Weekly opened up the Artys categories to include Best Graffiti/Street Art, his name came out on top as the top reader's choice. I got a chance to chat with the man himself about his exposure to the artform, perfecting his skills, the work he does today and his thoughts on local art and public reception to it. All with some samples of his work for you to peep out here. Kier chose not to have a picture of himself posted for this interview, so hey, how about a painted one? Gavin: Hey Kier! First off, tell us a bit about yourself. Kier: Well they call me Kier Defstar, and I love to paint. I've been painting for seventeen years, more or less. Kier: My older brother is a real good artist, he would always draw his own cartoons and do portraits and caricatures. 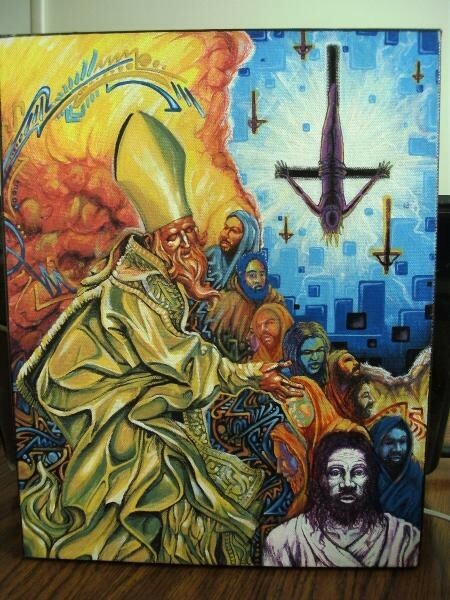 I also have a couple of uncles and an aunt who are superb painters. I was really drawn to it since an early age but never really acted upon drawing myself until I got into graffiti. Gavin: How did you get drawn toward Graffiti and how did you first get involved with it? 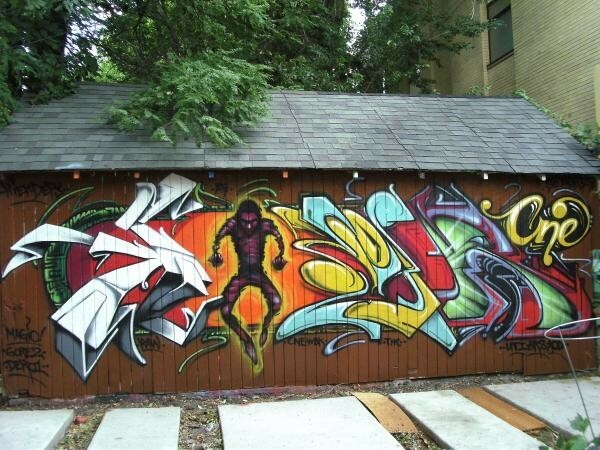 Kier: I mainly got drawn into graff in the 7th/8th grade. 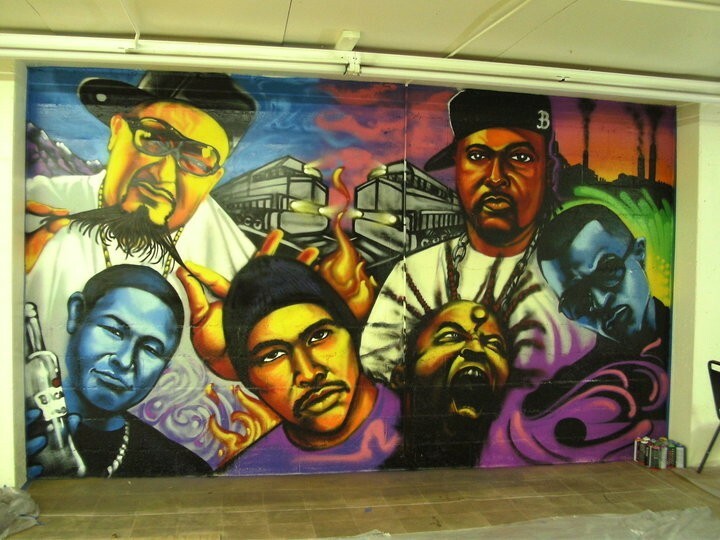 I was living in West Valley at the time and it had it's fair share of gang graffiti, but one day walking home from school I recognized a name that stood out more on a wall, it had a rounder cooler style to it than the typical blocky gang tags I was used to. It said "Brisk". I liked how it stood out on it's own and was actually someones name and not a set, I liked the individual aspect of someone going out there and advertising themselves. A couple of years later I actually became friends with Brisk who was a West Valley dude like me who lived in the neighborhood next to mine, and he has always been a major influence. But before meeting him, I used to skateboard all over the city and I'd meet a lot of other people who were way hipper to graff than I was and I started learning the rules, the soul, the why behind it. These people were Sker and Kero, Atone and Sarkoe. They really got me more interested. Plus they were some of the best, well Kero is still the best, haha. So slowly I started to do my crude tag everywhere. I had a few names before Kier stuck with me. Gavin: What were some of your first pieces like, and how was it for you honing your technique? Kier: My first pieces were horrible. When it came to art I was definitely no natural. In fact for some reason I was really nervous and scared of the art aspect of it because the people I painted with were already superb artists, and the talent that runs in my family decided to skip me. 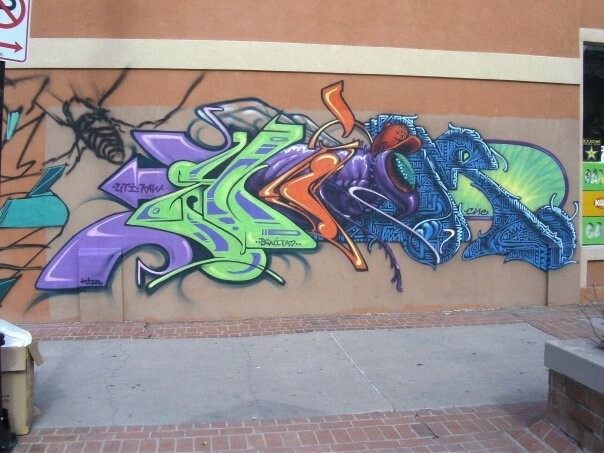 I actually didn't even attempt a real piece until a few years after just tagging the streets. 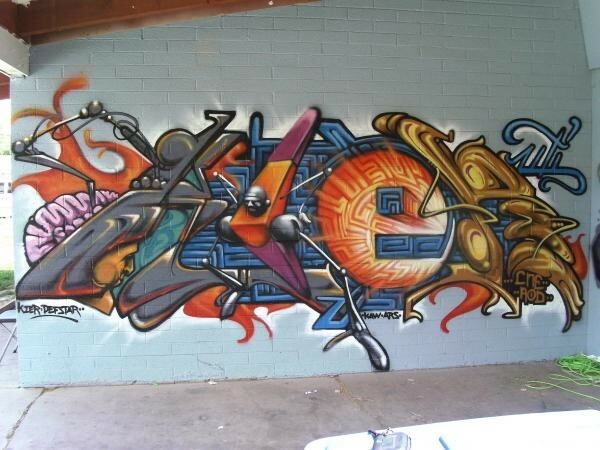 I had friends who started doing graff after me who advanced super fast, like Erups for example. But for me it was a long uphill battle. I'm still learning new techniques and trying to hone my craft everyday. 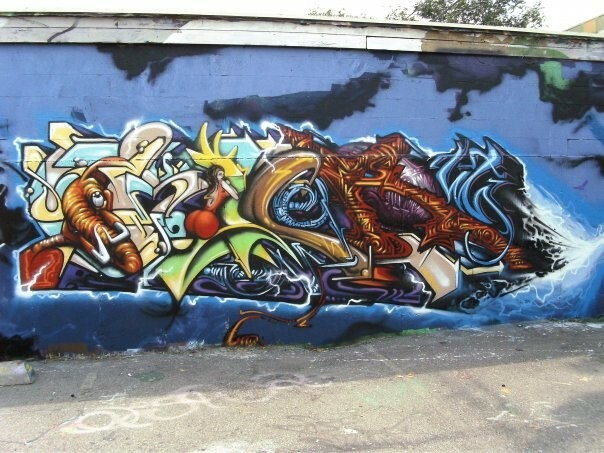 Gavin: In your experience, is there any real way to learn Graff, or is it more trial and error? Kier: To be considered a real graff artist you must pay your dues. I believe trial and error is a beautiful thing, my graff career is a product of it. To forge steel you got to put it in the fire first. There are artists who I believe don't take the proper steps and risks and challenges. They get on the internet and see all this beautiful art from around the world but instead of going out there and discovering and living it first hand, they copy their favorites and falsely call it there own then try to make a buck of it. They are culture vultures. You get no respect for that. You're art has to build a soul and character of it's own. I can truly feel the difference between different peoples art, it's like Benjamin Wiemeyer says, "it must give you that visceral feel." Besides just looking cool, you must feel the soul of the person behind it, the hints of a story, some personality. It goes deeper for me than just some wacky letters and vibrant colors. When I paint my name it serves as a vessel for me to tell a bit of myself through it. Not someone else's story, but mine. Whether the message be sad or humorous. Gavin: When you create pieces, do you put them on paper first or do you work from vision in your mind? Kier: Both. I'll go through phases where I'll draw every piece before painting it in order to come out or develop a new style. But I'll also go through phases where I'll freestyle so I can stumble upon something new. Sometimes I'll just draw one letter from my name and build around that. My mind is sporadic and what I like today I might hate tomorrow as in terms of my style. Gavin: How do you decide where to create a piece and how it will look on that particular site? Kier: I'll create a piece wherever the space is available. I don't typically try to make the piece fit the environment, I want it to stand out from the environment. I guess I try to use the space wisely. Sometimes it works. Hahaha! Gavin: Do you get hassled by the police for your work or do you tend to stay on good terms with them? Kier: I've been approached by police who were really cool, real people, that genuinely love art. I've also been approached by police officers who were completely arrogant, irritant, and all around power-tripping. The bottom line is we are all individuals. There are going to be good and bad people in any type of organization or business or walk of life. I don't think that those particular police officers I met, that had the all around bad attitudes, acted like that toward me because they were the "law" necessarily. I believe they acted that way cause that's the type of person they are even before joining the police, and in their daily lives. But in the past couple of years I've generally noticed very positive reactions and compliments from the police if they happen to stop by while I'm painting. 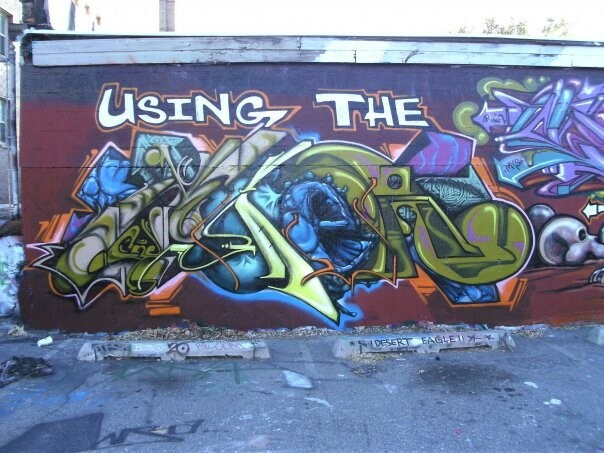 Gavin: Considering the work you do here, what are your thoughts on Graffiti as a whole in Utah, both good and bad? Kier: Hmm. That's a tough one. I think kids are lazier nowadays in general. When I was coming up there most of the artists could and would paint a little bit of everything, what I mean by everything is characters, letters, backgrounds, portraits, etc. They seemed more well rounded. It seemed like productions were more complete back then. Nowadays its hard to get the younger guys to help with those other aspects. They just want to paint their name then leave. Also kids not giving respect to each other or the spots that are designated to paint. When I was growing up respect was, and still is, everything. Now you have kids disrespecting everyone's work then talking smack on the internet like a bunch of scared punks. When you confront them and they see you're a grown man they get shook and apologetic, but I don't think they learn their lesson. For the most part the generation below 21 right now, and I'm talking about all kids, not just kids into this art, have been beat down by the stupidity of what is on TV and the music on the radio. I don't think any of them even read books! It's sad. I am truly getting old, hahaha! 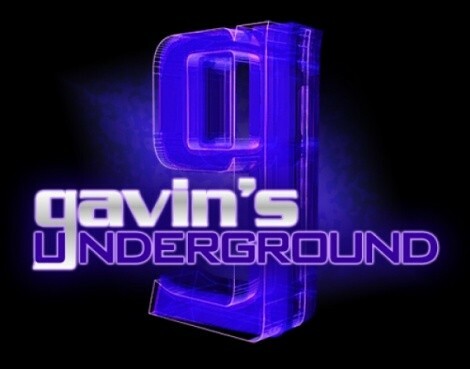 Gavin: Does it ever frustrate you that in some aspects its not really recognized as a major art form here, or do you enjoy that underground status? Kier: It's recognized by those who are ready to understand it. It's like this for me: Your friend has you check out a new band and you're not really digging it, then years later you're friend just happens to play that same band and now you can't get enough! I think some people are naturally drawn to it while it catches other's interest later on. Because the medium is so diverse that in our art we paint diverse imagery, everything from portraits, realism, beautiful scenery to cartoons, letters and funny topics. What I paint one day a person might hate but what I paint tomorrow that same person might want it in there house so they can see it everyday. I like it a little more underground though, then you know someone likes your art because they can truly feel it. Not because it's the popular thing to like. Gavin: Do you ever look over other Graff around the city for what others are doing, or do you concentrate more on your own pieces? Kier: I try not to look at anyone's art except for my friends that show me theirs. The reason being is that I sincerely want to come out with my own ideas and develop them my way. Not saying that I don't like other peoples stuff though, I probably like it too much! But I gotta concentrate on my expression, for better or for worse. Gavin: You were a part of the 337 Project and frequently paint on the wall left behind. How did you get involved with that, and how is it for you seeing how its affected the art community afterward? Kier: I think someone just told me that there was a wall down the street that people were painting and that I should go paint, Easy as that, haha. I think Adam Price is the best thing to happen to the art community. He has brought together so many different artists and has been so active in helping and supporting the community. Everything he creates and supports is so positive. And he's such a genuine good person to be around. He does this out of pure love of the art. Whatever you're art may be. He also creates fans of art, which is so important in order to help support the artists, and get more projects rolling and more art and culture in this city. He's a phenomenal individual right there. Thanks for everything Adam! 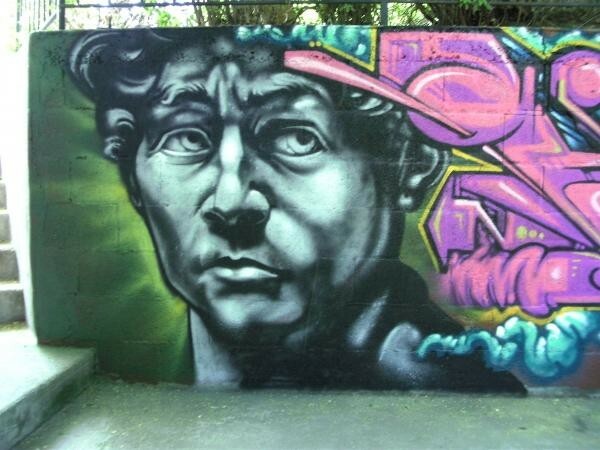 Gavin: Beyond Graff, you also create murals, portraits and paintings of various works. What made you decide to branch out and how has that impacted you as an artist? Kier: I get bored, I got to keep advancing and developing, if not then what is the point. I couldn't paint the same thing over and over again. There are so many ways of expressing myself, why not try them all! Gavin: Do you do commissioned work for people? Kier: I do a a lot of commission work, if you're looking for anything contact me at kierdefstarhernandez@yahoo.com. The process is different with each job. I cater it to the individual who is hiring me. 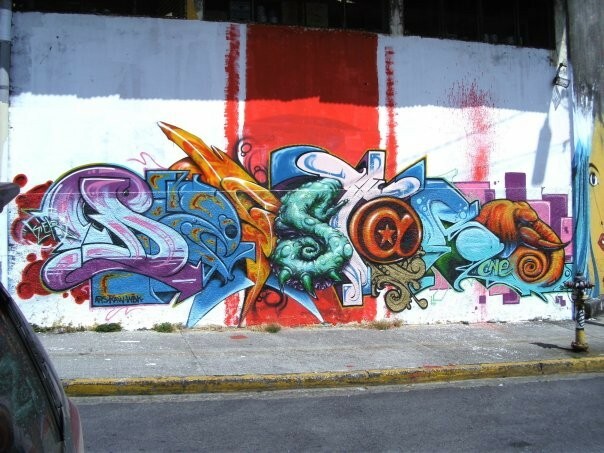 Gavin: What do you recommend for people looking to get into doing Graff? 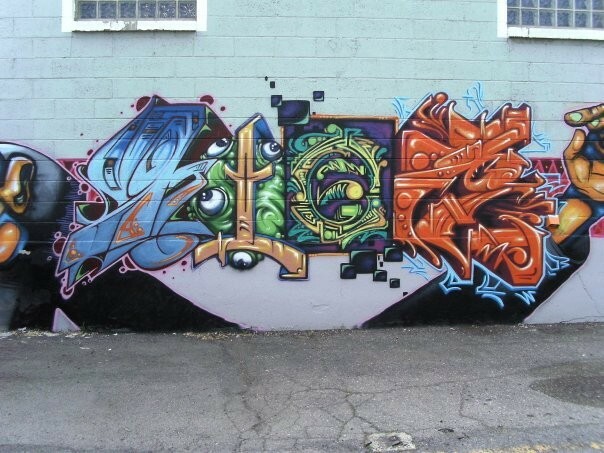 Kier: Learn you're graff history, locally, nationally and internationally. And read about the history of the world too. And just be a smart, respectful, good individual overall. Read books, damnit!! Gavin: Aside from your artwork, you were also involved with All Nation Magazine. How did that publication come about and how was it for you to work on it? Kier: I didn't do anything really. All the hard work and accomplishments of the magazine were made by one man alone, Brook Seeley. Gavin: Recently you won an Arty for all the work you do, the first given out for Graffiti/Street Art. What's it like for you to receive that kind of recognition? Kier: It was cool! I just thought it was funny how they made such a big deal about adding that category, that I won in particular, at the beginning of the Arty's, and then didn't show any of my work. Haha! Gavin: You also travel around beyond Utah to promote Graff and art in communities. What drove you to do that and where have you been over the years? Kier: I've lived coast-to-coast and also in Costa Rica because my family is from there. I'm moving back there soon. Traveling is the best. I like to experience things, I like people. I got homies all over. I don't necessarily go to these places to promote art, I definitely do my art while I'm there just because that's a part of me. 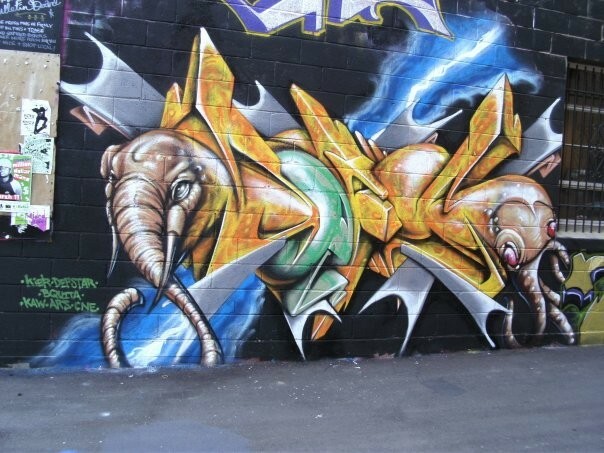 Gavin: Moving onto local stuff, what's your take on our local art scene, both good and bad? Kier: I think the art scene is growing in general which is great, Utah lacks a lot culturally and in the past has tried to stifle anything that could enrich a Utahans life. Utahans in general are a mall shopping, trendy, can't think outside the box culture. Well not so much now, I think there are way more open minded people here now than there used to be. It's good that the art scene is getting bigger because it shows that the general population is now consuming something more thought provoking and perhaps enlightening instead of consuming the same old trash in TV and the media. One thing I hate about Utahans is their unwillingness to pay an artist what they deserve! Look at it this way guys, you pay hundreds of dollars for a name brand mass produced pair of jeans or purse, and you're unwilling to pay an artist for a one of a kind piece of art? I've seen people try to haggle over price over an original piece of art. It's funny because typically those people that have to buy the designer things to impress their peers and act like they have class are the most unclassy individuals. IF YOU ARE GOING TO APPROACH AN ARTIST AND YOU WANT THEIR WORK, BUT WANT TO TRY BARGAIN SHOPPING THEM, THEN YOU PROBABLY DON'T DESERVE TO HAVE THEIR WORK AND SHOULDN'T WASTE HIS OR HER TIME BY TALKING TO THEM. I think artists are to blame too. They let Utahans down the value of their art instead of sticking to the true value of it. Not everyone can do art. And if your art is worth buying then the consumer should recognize that and pay what it's worth. Kier: I think more Utahans and businesses alike should promote and support local artists more. I've seen businesses get someone out of state artist to do art here or do a design for there company when they could've used one of Salt Lake's many great artists. Like Chuck Landvatter, Sri Whipple, Chew, Trent Call, Benjamin Wiemeyer, Kero... I could go on for days. Salt Lake has so much talent that Utahans overlook because they think he or she is just some "local guy". I'll put anyone of those guys I mentioned against a lot of artists out there. Wake up Utahans! You have an outstanding talent pool right under your nose! Kier: I'll be out of state and the country a lot, painting. I should be painting at the the EVE event at the Gallivan this New Years, so come by everyone. I'll probably be working on canvases with oils and acrylics a lot this winter. But I'll always be painting regardless and trying to try something new. Always moving forward for sure. Like I said, I'm pretty sporadic so we'll see what happens.